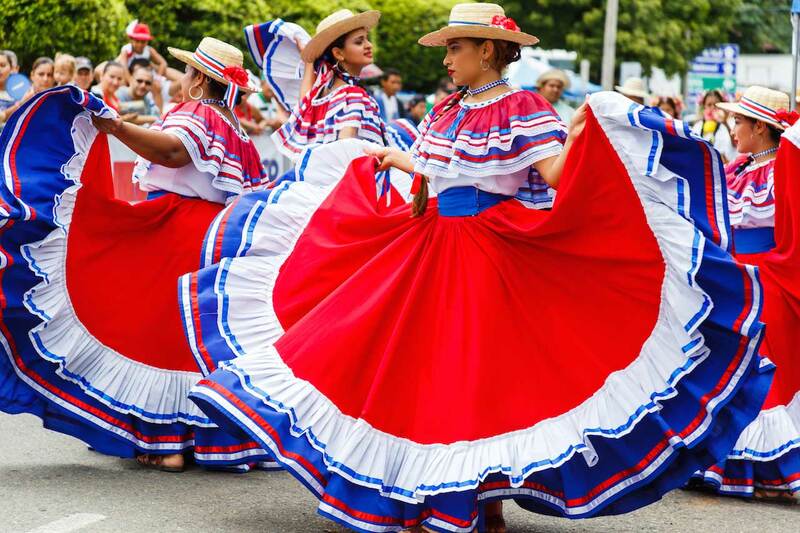 Puerto Viejo de Talamanca is a small and lovely Afro-Caribbean culture town lying on the Caribbean Sea along the Atlantic Ocean, in a natural context of incomparable beauty. 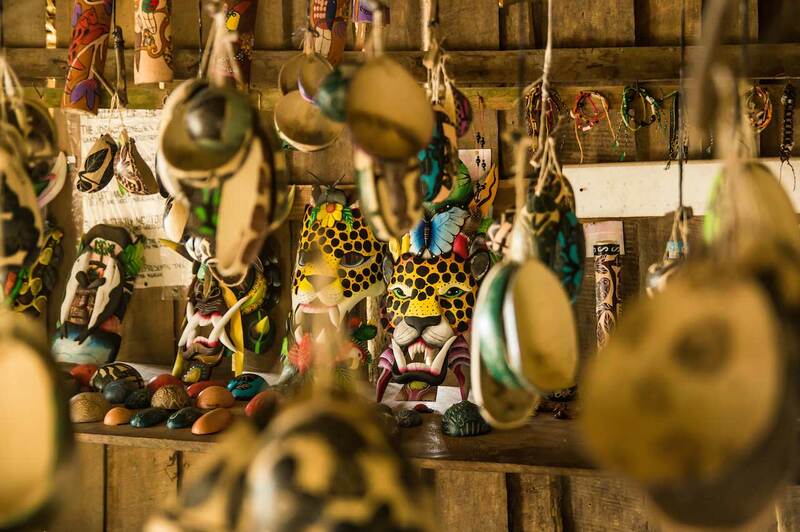 It is about 50 km from Limón which is the chief town of the Province. 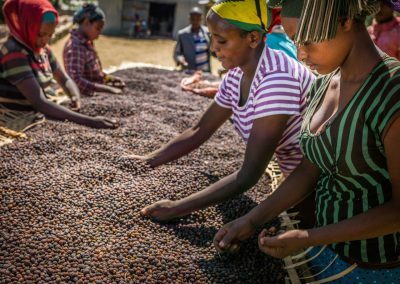 The resident population is made up of Afro descendants settled permanently in the early 20th century with the addition of many Europeans who, in the last twenty years, have started small businesses or simply enjoy retirement. 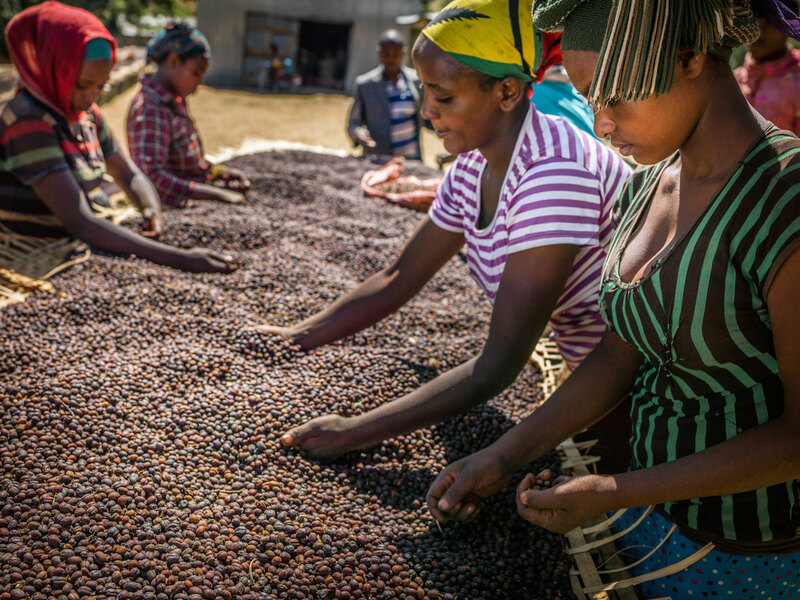 The climate is warm throughout the year with temperatures ranging between 26 and 32 degrees. The rains are distributed without a precise logic for the whole year, even if a relatively drier period is generally from January to April. 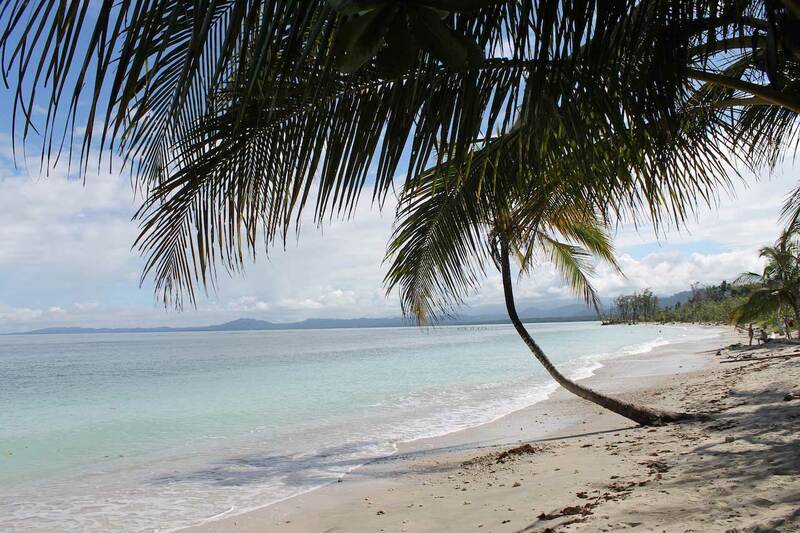 The beaches around the pueblo are among the most beautiful and well-known in Costa Rica. 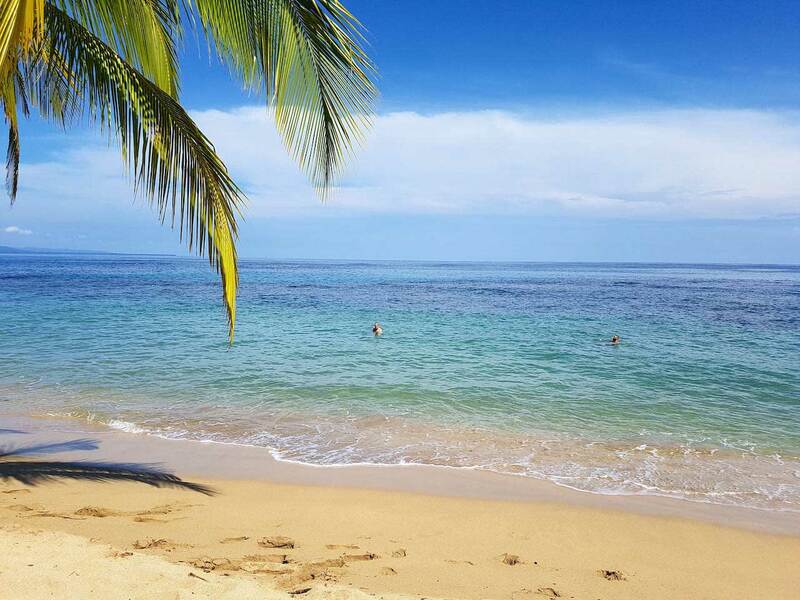 Among them there’s our Playa Negra, and then Cocles, Playa Chiquita, Punta Uva, Manzanillo and many others. 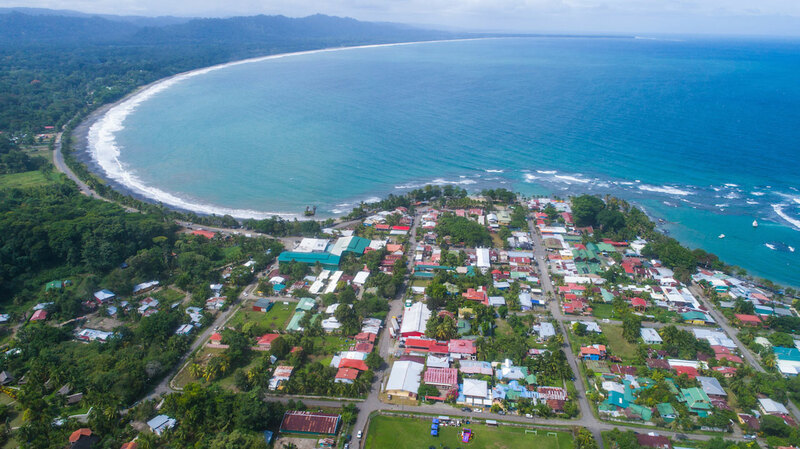 The town of Puerto Viejo is endowed with all the services and can be reached from the capital by bus and easily from our house by foot or by bike in a few minutes. 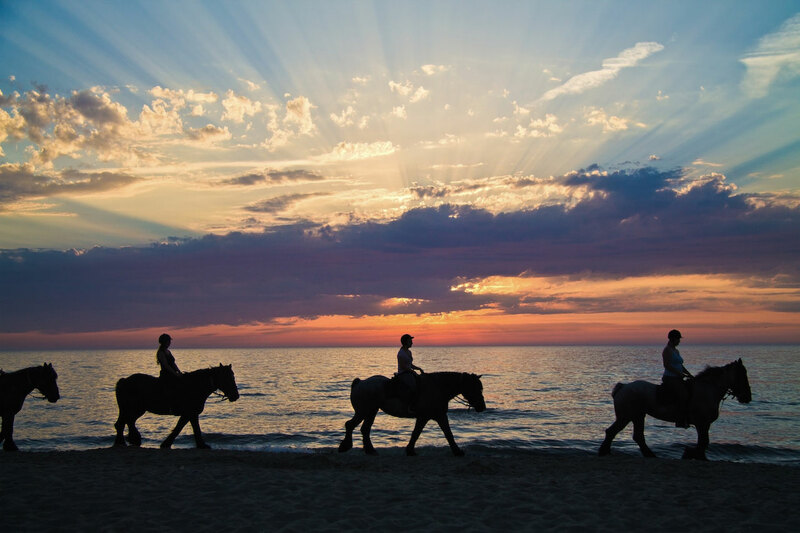 We recommend going to the town through the beach walking along the shoreline. So you will witness the spectacle of cormorants fishing close to the shore and you can enjoy all the beauty of this deserted coast, a black pearl between the cobalt of the ocean and the emerald green of the vegetation that surrounds it. 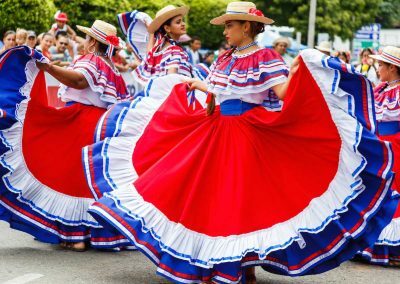 The Caribbean area of ​​Costa Rica has long been one of the most important tourist destinations in the world for the pristine beauty of its tropical nature, for the fame of its parks, for the many activities suitable for all tastes and the pleasantness of people living there. 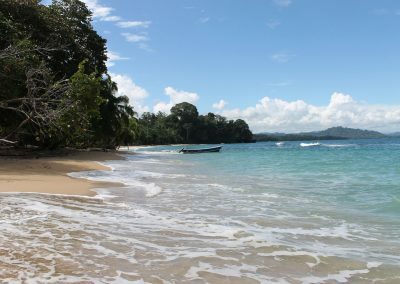 Puerto Viejo de Talamanca, a small town located on the sea and a destination for important flows of international tourism, is a perfect synthesis of this reality. 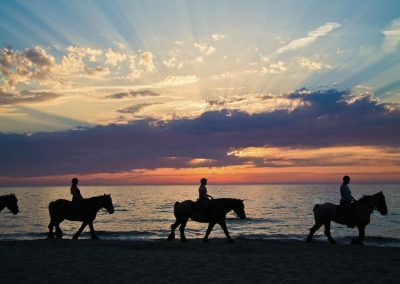 In 2011 it was listed as the eleventh place in the world not to be missed by the prestigious magazine Frommer’s and its beaches have for many years been considered among the most beautiful in the country according to the Lonely Planet guide and many other international magazines. 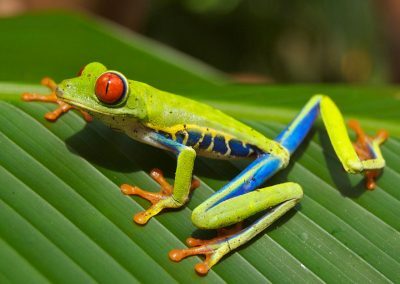 Going to Puerto Viejo means experiencing the Caribbean in a very particular context where nature and traditions merge and offer an unrepeatable opportunity to immerse yourself in a corner of the unspoiled and wild planet, without giving up a good level of services. Our houses are inserted in a tropical garden a few steps from the Atlantic Ocean and have high quality standards designed to make comfortable the stay of all our guests who reach us from all over the world. 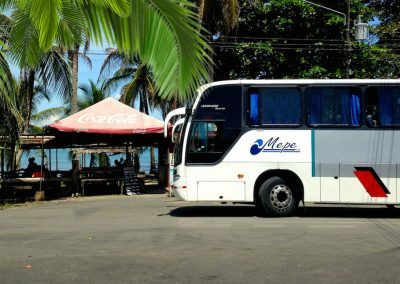 The bus is the simplest and cheapest choice with five daily departures from the capital of San José. 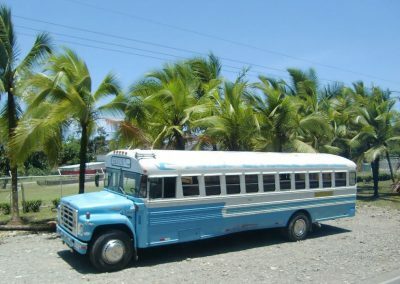 The departure for Puerto Viejo de Talamanca and Cahuita is from the Terminal Atlantico Norte located between Avenida 9 and Calle 12 in Barrio Mexico. The buses are those of MEPE transport company. At the ticket offices, the only place where you can buy tickets, you pay about $ 8 and the trip lasts an average of 4 hours including a short stop in Limón for refreshment. ATTENTION >>> if you arrive at the airport after 2:00 p.m., you will hardly be able to take the bus because San José has a considerable traffic and the last ride starts at 4:00 p.m.
You can also book the trip by phone the day before (except for the one of 6 a.m.), but remember that they only speak in Spanish and that you have to go to the ticket office at least 30 minutes before the departure time. 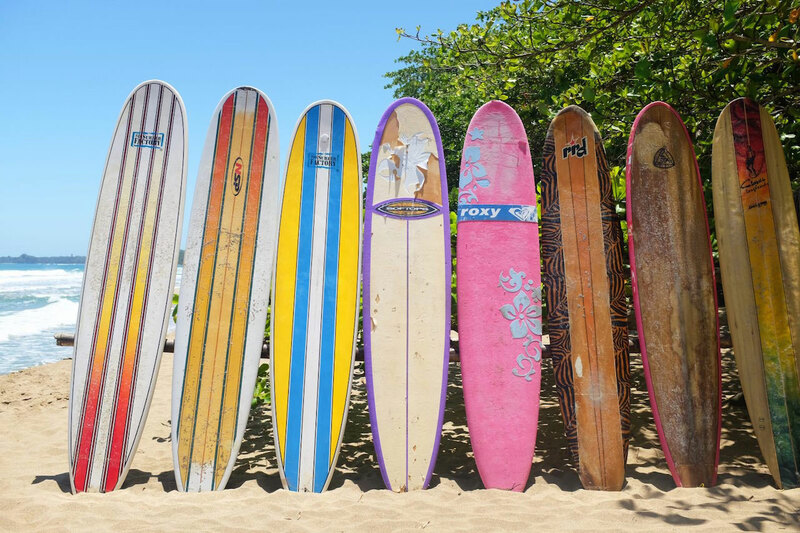 This, instead, is the current schedule of departures to Puerto Viejo. NOTE: both telephone numbers and timetables are obviously subject to change. At a cost of 45-55 dollars there is an air-conditioned minibus service run by several private companies. 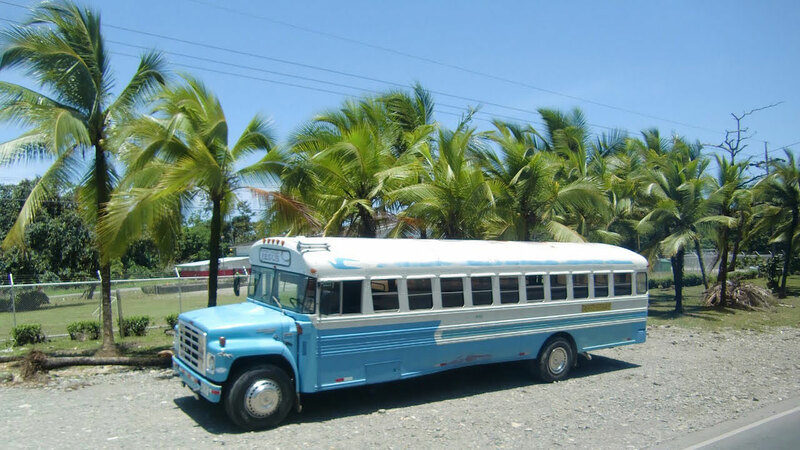 Interbus, Gecko Airport Express and Easy Ride manage daily transport from San Jose to Puerto Viejo and back. You will be picked up directly at the hotel in San José or even at the airport and left directly at your destination. 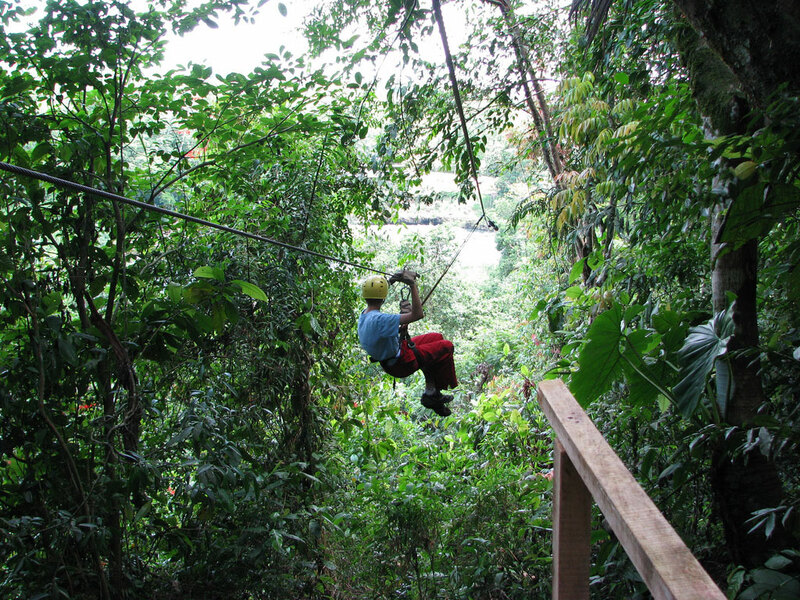 You can book this service with Gecko Trail Adventures or with Interbus. 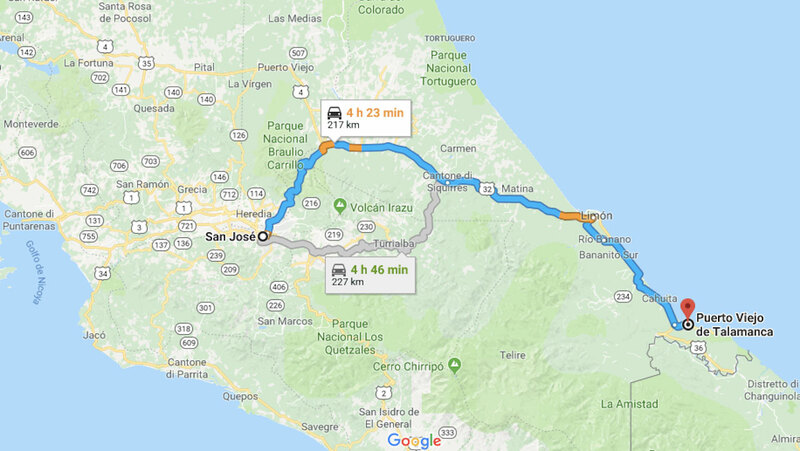 If you intend to rent a car, consider that all the major companies have branches in Costa Rica with offices inside or however close to the international airport of San José in line with the competitors. 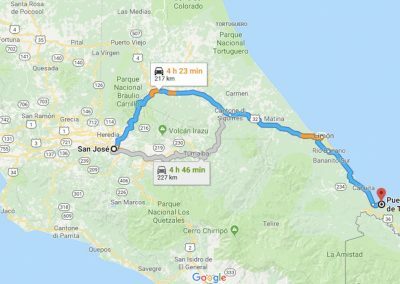 With the car, take Route 32 from San José and follow it to Limón; from there take the road 36 in the direction of Cahuita and Puerto Viejo always following the coastal road. 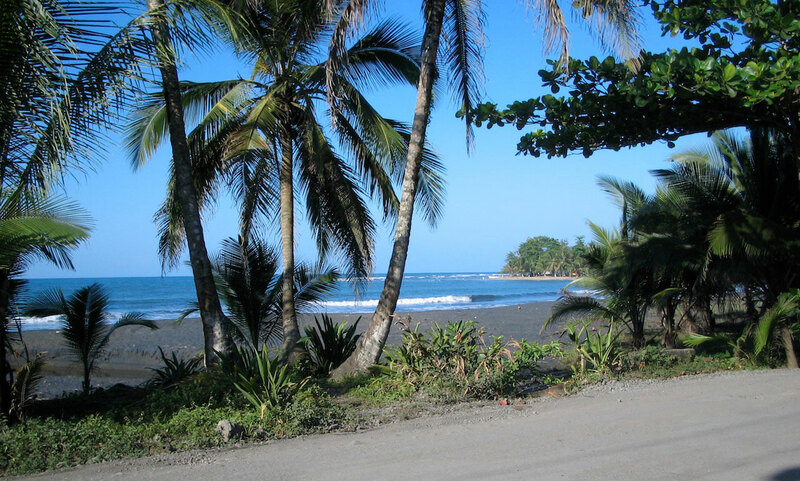 After the town of Hone Creek follow the 256 road until you get to Puerto Viejo de Talamanca. We suggest you not to travel after sunset because the part of the road you need to travel as soon as you leave San José crosses the Braulio Carillo National Park and has no lighting, almost no traffic signs and it’s full of hairpins. If you want a personalized service to and from the airport, you can book it directly by sending us an e-mail with your arrival time and flight number. Ines, a trusted person, will be waiting for you at the exit of the airport. 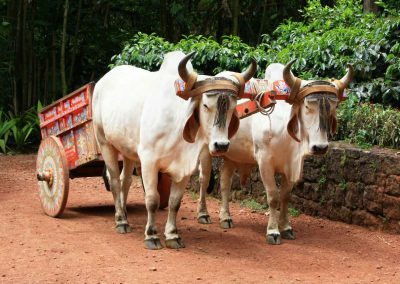 The cost of the service is $ 190 for a car (up to three people) or $ 270 for a minibus with air conditioning (needed for more than three people). 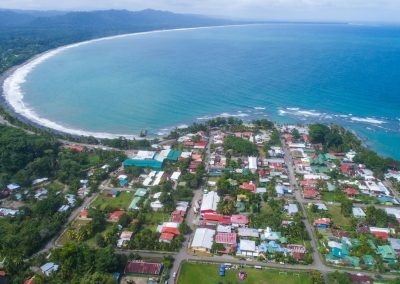 The town of Puerto Viejo de Talamanca, sleepy during the day but lively in the evening and at night, is an archipelago of possibilities for all tastes and all ages. You can walk during the day, along the main road or along the beach, passing from an ice-cream parlor to a souvenir shop. 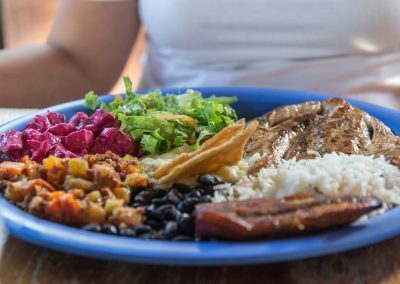 You can stop to eat in one of the many “sodas”, small local restaurants, where you can enjoy the famous “gallo pinto” or “casado”, tasty local dishes made with eggs, rice and beans cooked in coconut milk and accompanied by cheese, meat or fish. 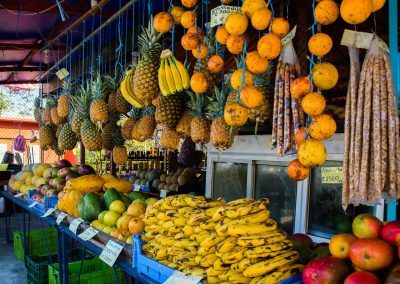 If you know a little Spanish or English, you can chat with the local people who are generally kind to foreigners and always have interesting stories to tell. The Saturday market (open from 6:00 a.m. to 12:00 a.m.) offers high quality organic products and is a pleasant environment frequented by tourists and locals. 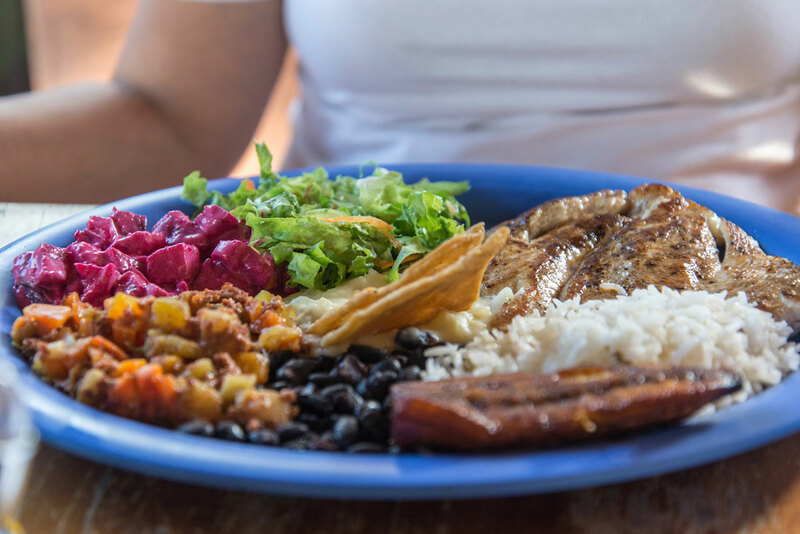 The restaurants, with Caribbean or ethnic cuisine, are really of excellent quality and make the area one of the richest in terms of the quality of gastronomic products and for the variety of culinary culture. For nightlife lovers there are discos and pubs that, especially at weekends, are open until late at night. 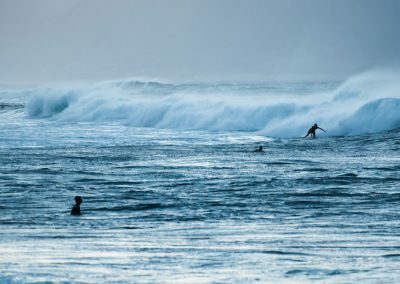 For the lovers of sea life, there are obviously many opportunities. 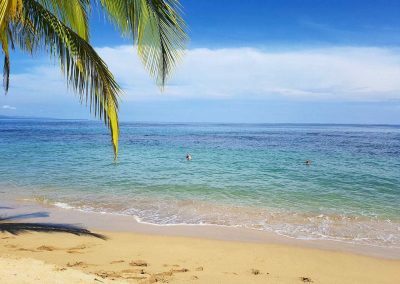 You can simply enjoy the many beaches, often almost deserted, including “our” Playa Negra, or Cocles, Playa Chiquita, Punta Uva and Manzanillo. 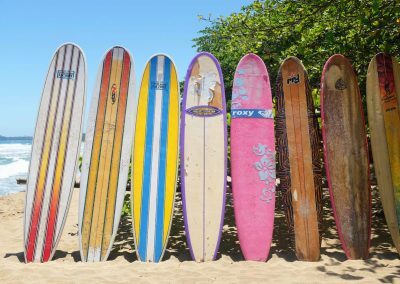 Surfers will appreciate the “break points” of Salsa Brava and Cocles, while those interested in fishing, diving or snorkelling have endless opportunities to engage in the activities they prefer. 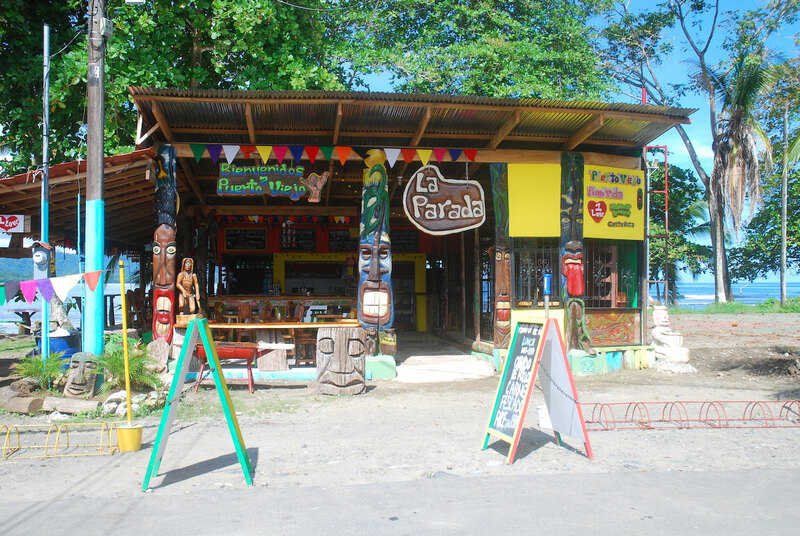 In Puerto Viejo and Punta Uva there are two excellent diving centers, which organize PADI courses and day trips. In the village the numerous small tourist agencies offer a variety of proposals for boat trips, from deep-sea fishing to the simplest fishing on the coast, which allows you to know the uses of local fishermen. 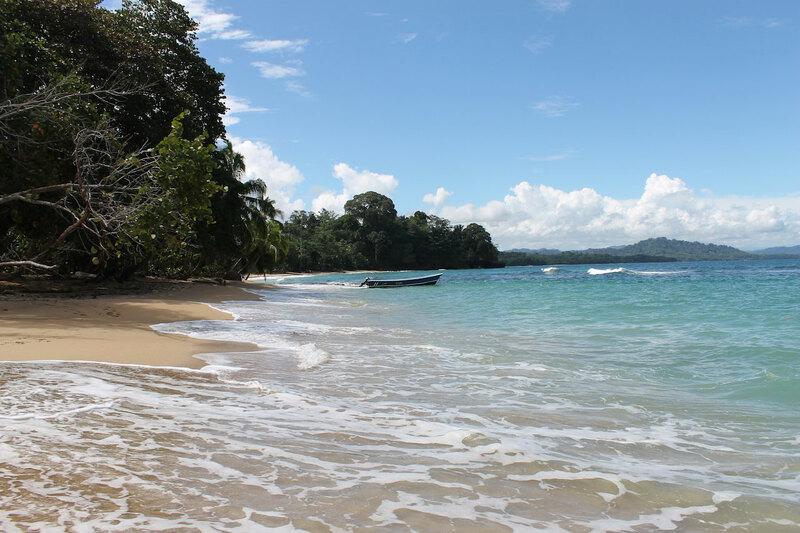 Snorkelling is especially indicated in the Cahuita Park, where the reef offers protection to a variety of truly extraordinary species, but there are also interesting points in Punta Uva and Manzanillo area. Finally for lovers of hiking, they are spoilt for choice. 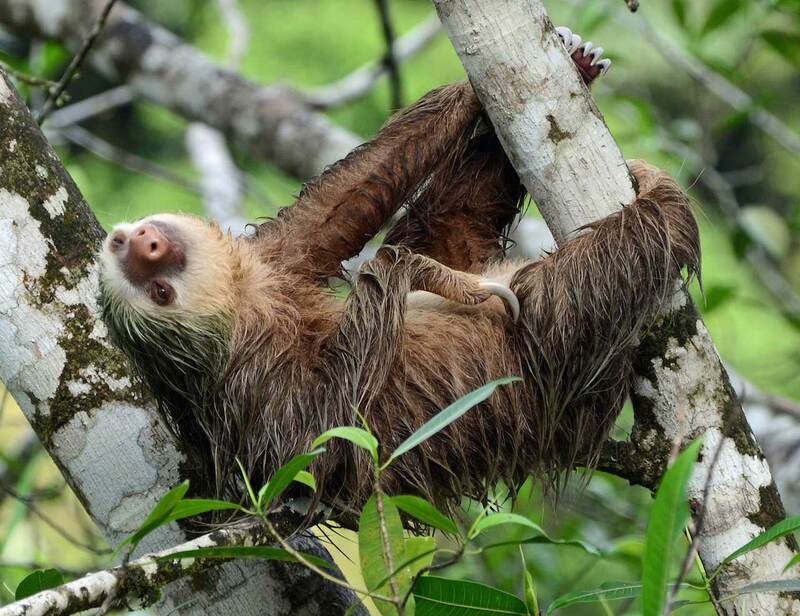 A must in the north is the visit to the Cahuita Park, which offers an extraordinary example of coastal rainforest and, to the south, the Gandoca-Manzanillo refuge, another remarkable coastal environment that leads you, after the splendid Punta Mona, to the border with Panama. 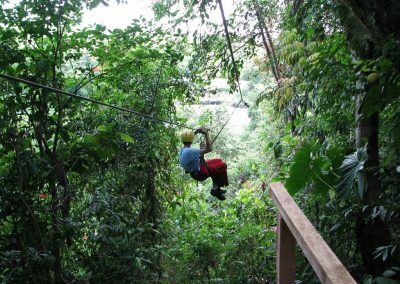 Keep in mind also the opportunity to have fun in the Adventure Park by flying on a zip line, doing Beach Hop on horseback or visiting cocoa and coffee crops. Leaving from the small port of Moín you can reach, in about three hours of navigation in the Tortuguero canals, the world most important sea turtle nesting place, true oasis of land and water where you can admire an impressive variety of animal and plant species. 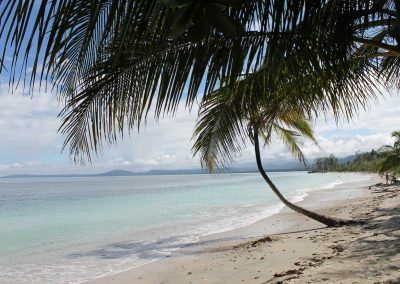 Beyond the border, to the south, you can instead reach Panama in two hours by car or bus to visit the famous Bocas del Toro Archipelago, and appreciate the beauty of a pristine marine environment among mangroves, crystal clear waters and the lively community of Colón Island. 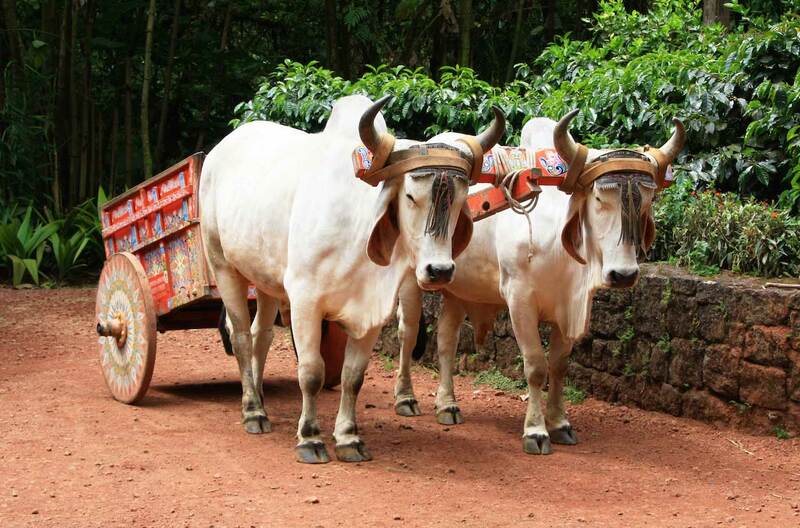 A visit to the Bri Bri indigenous communities is really unmissable on the Talamanca mountains to have direct contact with the Indian culture and to know very different lifestyles compared to ours. Puerto Viejo is a charming town lying on the Caribbean sea with an “historical” nucleus made up of a group of inhabitants of Afro-Jamaican origin, mostly hunters and fishermen, who settled in the rainforest in the first half of the 19th century, when there was still no connection with the rest of the country. 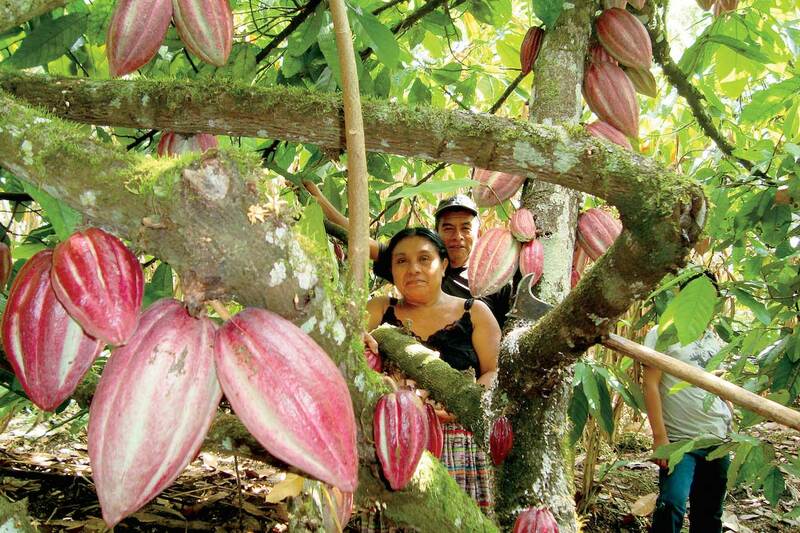 In the following decades, the profitable cocoa crops made this small town wealthy as well as a large area of ​​the Caribbean, but the subsequent introduction of the intensive cultivation of bananas by multinational companies quickly upset local productions, changing the social fabric and the very shape of the territory. The epic construction of the “ferrocarril” first, then the railway line between Limón to San José and the construction of the current state road, connected the Caribe with the rest of the country and the black population came into contact with the Costa Ricans, never totally identifying with them and remaining in some way a well-defined community with its own traditions and customs. 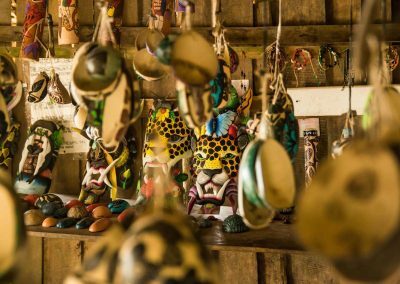 The rapid growth of tourism over the last fifteen years has further changed the table and today Puerto Viejo, in addition to the original ethnic group, sees the stable presence of many Europeans (at least 40 nationalities, covering almost 60% of the total population). It’s about either foreigners who have chosen to live the retirement years with another rhythm, or people who have opened small businesses in the tourism and catering sector, with, obviously, a large group of Italians in the lead. As luck would have it the abundant rains have kept away the large real estate groups that here, unlike certain areas especially on the Pacifica side, have never invested in those typical destructive hotel facilities that have now altered most of the coasts around the world, transforming the coastline, patrimony of all the people, into portions of territory remodeled for the benefit of a few. 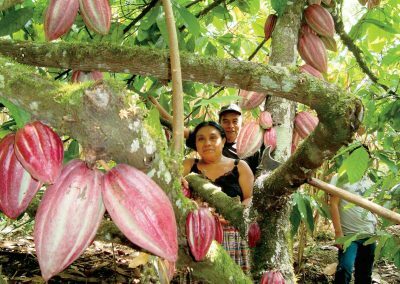 The entire coastal area, which goes from Cahuita to Manzanillo and known as CARIBE SUR, is articulated on a narrow strip of land about twenty kilometers long and the impact of the “built” on the territory, very rich in vegetation, is still modest and all in all acceptable . The coastal humid tropic forest here manifests itself in all its overbearing beauty. 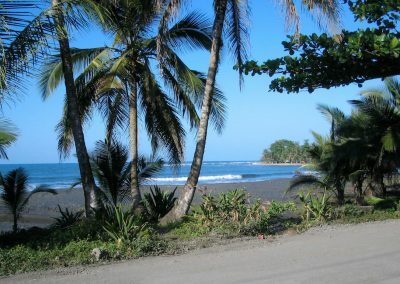 In this tract of the Caribbean Sea, there are magnificent beaches one after the other and each with its own particular characteristics, from the extraordinary Cahuita Park in the north to that of Manzanillo and Gandoca to the south, while behind the imposing Talamanca mountain stands with its forests inhabited by the indigenous Bri Bri and Cabecar communities. 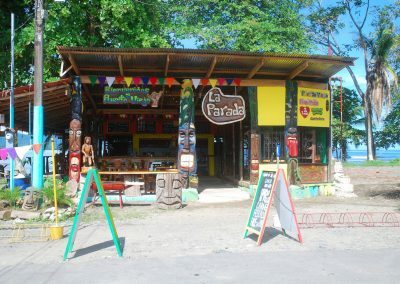 The town of Puerto Viejo de Talamanca, located precisely in the center of this area, is almost entirely built with lively colored wooden houses and has public and private schools up to primary schools, churches, banks, first aid clinic, souvenirs, supermarkets and many other services. 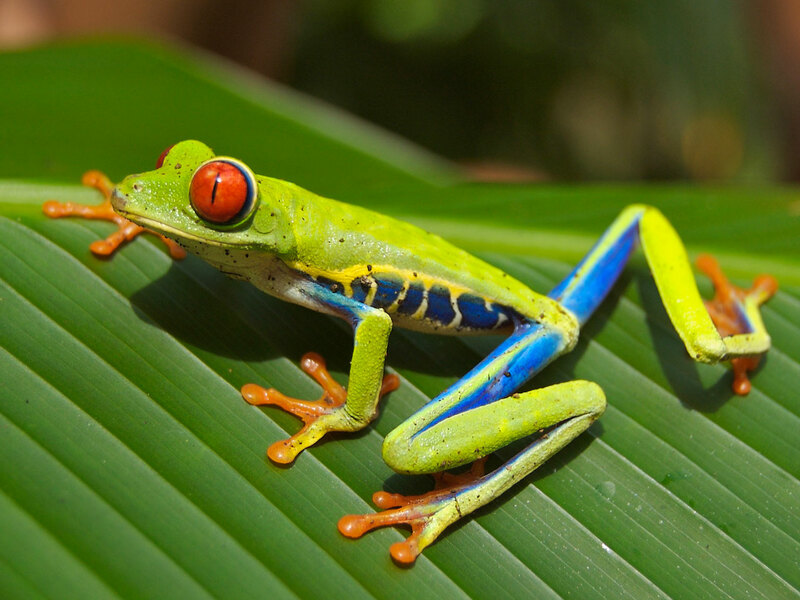 The Caribbean coast of Costa Rica is characterized by a typically tropical climate. 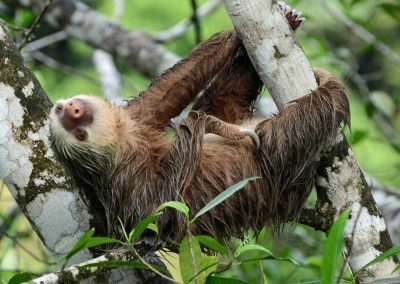 Usually humid, with average temperatures around 24-32 degrees and frequent rains (hardly predictable) throughout the year, normally more abundant at night. However it is not subject to hurricanes and monsoon winds. The sea is generally rough, with the exception of the months of September and October. 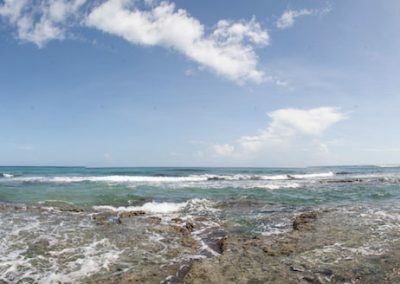 However, there are some beaches protected by the coral reef where the water is quieter and the swimming is pleasant.